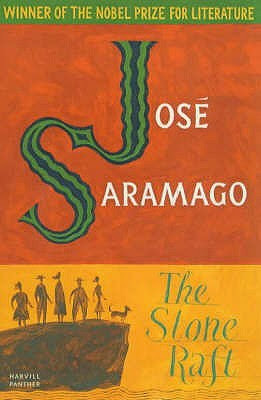 It's been a while since I have read a José Saramago book. So for this time, I picked up The Stone Raft, another one of his fables where some extra-ordinary premise happens, and the ordinary citizens affected by this extra-ordinary premise needs to deal with their changed surroundings. I loved these novels: in The Double, Saramago tells the story of a man who realizes that there is another man out there that looks exactly the way he does; in Blindness, he narrates a story of an unnamed country where everyone (with the exception of one woman) becomes blind; and in Death with Interruptions, he tells the story of an unnamed country where people just stopped dying. Here, in The Stone Raft, he narrates a story when the Iberian Peninsula suddenly breaks away from the rest of Europe and floats toward the Azores. And yes, I am again impressed by Saramago's story-telling skills, and how he can tell a story both at the macro- and the micro-level, showing the effects of this magically realistic occurrence both on a country, and on its individual citizens. See, while this book is about the extraordinary detachment of Spain and Portugal from the rest of Europe, the story actually focuses on just a handful of individuals: three men, two women, and a dog. Somehow, these individuals are linked together with each other, because they somehow experienced supernatural phenomena that are all related to the Iberian split. One guy suddenly has several birds follow him, another gained superhuman powers and was able to lift a heavy stone and hurl it to the ocean, and yet another guy was able to feel the shaking of the earth, even though seismographs don't seem to register tremors. The women are the same, as they also experienced extraordinary occurrences that are somehow related to the geological event. What I like the most about Saramago and his writing is the fact that he is able to turn these what-if scenarios and deeply contemplate on them. These fantastic scenarios typically lead to fantastic consequences, at least in Saramago's world. And he is able to talk about it both at the country-level (there's plenty of discussion about international politics as the drifting of the Iberian Peninsula towards the Americas is potentially dangerous), and at the individual-level. And I like how Saramago can capture his readers and draw them into his world easily. I suppose the way I see it, Saramago must have a great understanding of the human psyche, as his novels pretty much sketches human behavior, especially when confronted with fantastic situations. It takes enormous maturity to be able to do this at a plausible and believable level. And that is why I love reading Saramago's novels over and over again. Overall, this novel was about one's cultural identity. Saramago focused on five individuals, Portuguese and Spanish, and tackled the question of what it meant to be European, for these five people, when suddenly, they all found themselves to be detached from Europe. Everyone acted differently, and unpredictably. For me, this book illustrates what would happen to people if they were suddenly removed from their bubble, from their comfort zone, from their familiar surroundings. This is definitely a book I would recommend reading, as I have enjoyed it a lot. I give this book 5 out of 5 stars.